Jason Kohr, surrounded by family, signed a letter of intent to attend the University of Dayton. 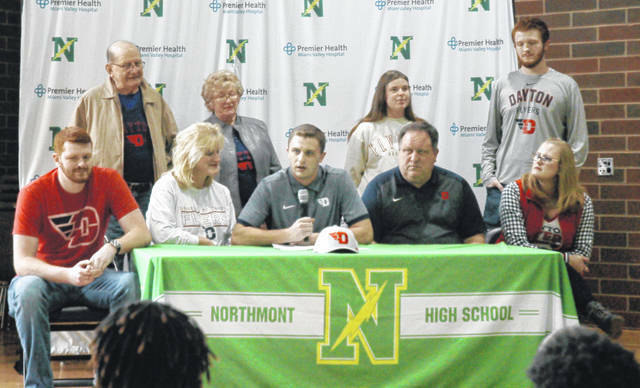 CLAYTON — Five Northmont football players will continue their playing careers in college after signing letters of intent on national signing day Wednesday. Danny Lewis and David Weherley signed with Marian University, Jason Kohr with the University of Dayton while Nolan Roach and Miles Johnson signed with Urbana University. Kohr, a 6-foot, 3-inch tight end, was described by head football coach Tony Broering as a great student. Kohr had 17 pass receptions for 222 yards average 13.1 yards per catch, mostly clutch receptions when the team needed to get a first down. He also thanked his siblings and his grandparents as well as all of his coaches for helping him out in the weight room and for being tough on him and thanked his friends and teammates. He said he is looking forward to furthering his academic and athletic career at the University of Dayton. Roach is a 6-foot, 3-inch, 275 pound offensive tackle. His father, Aaron, devoted 13 years of his life keeping the official statistics for the varsity football team and also coached eight years at the pee wee level. Danny Lewis played multiple positions for Northmont over the years from cornerback to wide receiver. Lewis thanked everyone for attending, as well as God and fought back tears as he thanked his parents for their support over the years. “Coach Broering’s motto was that football is a small piece, but in the bigger picture he wanted us to be the best son, the best brother and best person we could be,” Lewis said. Broering said when he first met Lewis as a freshman he knew how great he was going to be. David Weherley is a 6-foot, 1-inch, 310 pound offensive lineman. Weherley thanked God, his family and his parents for everything they have done for him over the years. “I couldn’t do without my Dad because he is always pushing me,” he said. He credited his Mom for helping with his goal to attend college. Broering recalled that whenever he went to the weight room there was always a little pudgy kid in there cleaning up. Miles Johnson was the Thunderbolts quarterback for the last two seasons. He led the GWOC with 2,214 yards passing with 26 touchdowns and only nine interceptions his senior year after passing for 2,068 his junior year with 23 touchdowns and 11 interceptions. Like the rest of the players Johnson thanked his teammates and his family as well as all of his coaches for everything they did to make his career at Northmont a success.